Knorr Chicken Broth is a delicious blend of chicken, onion, carrot, celery and spices. The rich and authentic taste adds great flavour to your cooking. The rich and authentic taste of Knorr Broth adds great flavour to your soups, stews, sauces, stir fries, vegetables and side dishes. Chicken broth (water, concentrated natural chicken broth, natural chicken flavour, salt, yeast extract), sugar, natural vegetable seasonings (celery, carrot, onion), spice and vinegar. May contain traces of milk ingredients. 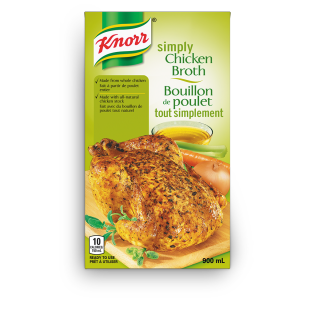 Use Knorr Broth as a base in soups, stews, sauces and gravies. Or add it to simmer vegetables, rice, pasta and other side dishes.